ipConvLite is a universal protocol converter for transferring data between different protocols. ipConvLite is based on ipConv and has basically the same abilities. In contrast to ipConv ipConvLite is designed for small to medium applications and has a lower performance. ipConvLite is available in conjunction with hardware models SEC3, MEC2, MEC2 PROFIBUS and MEC2 PROFINET. The following ipConvLite Use Cases illustrate some of the possible applications. To meet even increased security requirements, ipConvLite is fully capable of redundancy in combination with a second device. With redundant protocol converters, reliability can be ensured, based on the "hot standby" principle. At any one time only one device assumes the active role, while the passive device monitors the active one and takes the initiative if it fails. This minimizes downtimes due to maintenance work or component and interface outages, for example. 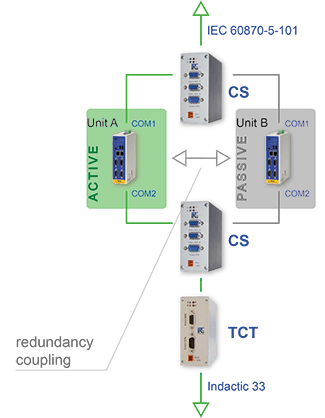 The redundancy coupling can be realized via Ethernet as well as over serial connections. If separate serial communication connections must be connected to both redundant devices, the CS channel switch will be applied.